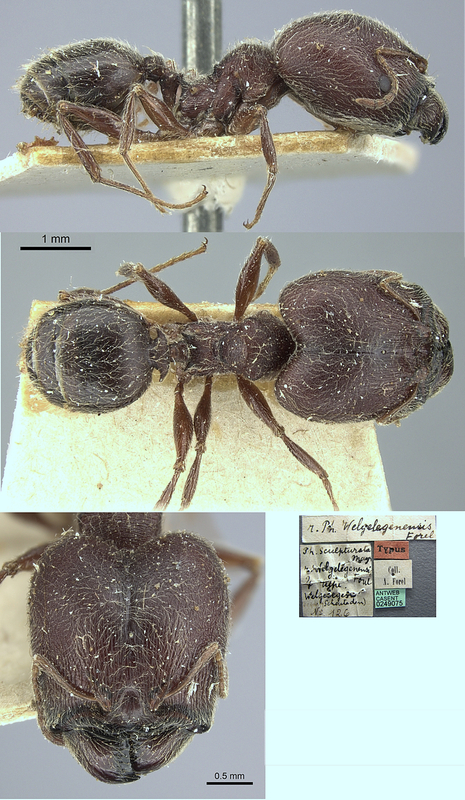 junior synonym dignata (Pheidole sculpturata Mayr stirps dignata n. stirps, Santschi, 1915c: 250, major & minor) from Congo, collected at Gomba & Mandougo, by A. Weiss - see below. Major and minor described . 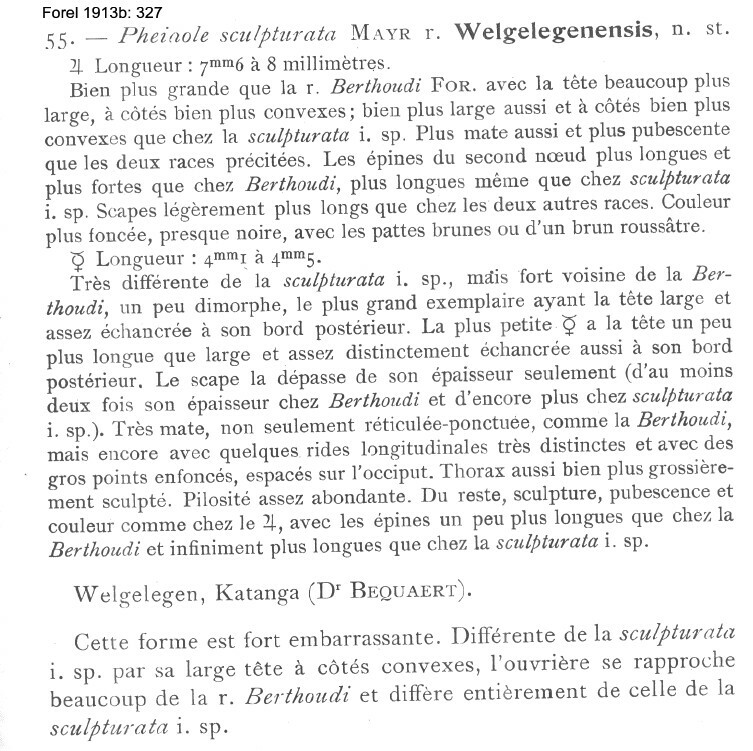 Forel's (1913b) description of welgelegenensis is at . 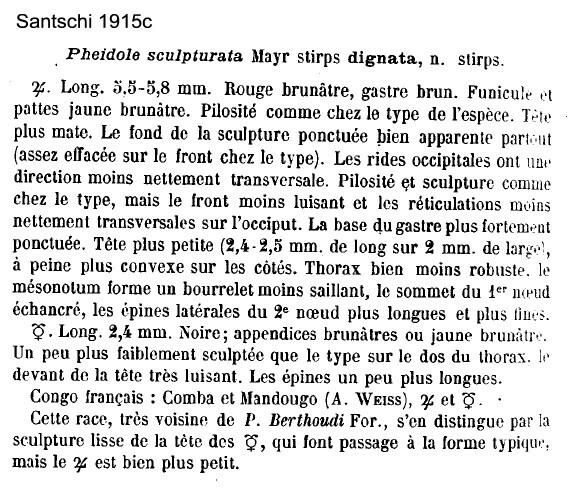 Santschi's (1915c) description of dignata is at . MAJOR. TL 5.5-5.8; head smaller than type, HL 2.4-2.5, HW 2; slightly more convex on sides. Thorax not so stout; mesonotum with a less raised ridge. Petiole node impressed, postpetiole with lateral spines longer and finer. Colour red brown, gaster brown; funiculus and tarsi yellow brown. Pilosity as type. Head more matt, with puncturate ground sculpture clear all over (effaced on the face of the type), occipital reticulation less clearly transverse; base of gaster more strongly puncturate. MINOR. TL 2.4; slightly less sculptured than type on dorsum of thorax, front of head very shiny; propodeal spines longer. Black, appendages brown or yellow brown. Specimens from Comba and Mandougo - Santschi has these as "French Congo" but Wheeler (1922) noted that such locations were not on any map. Modern gazetteers have a Mandougou in Guinea and Comba in Central Angola. The collector was A. Weiss, who otherwise made many collections around Brazzaville, Congo. In Ivory Coast, from Sudan savannah at Ferkéssédougou, and also from humid savannah (Lévieux, 1972, 1983a). Bernard (1952) reported seven minors from N'Zo, Guinea. He noted it was previously unknown from Guinea being a species of central Africa but presumably he assumed he was looking at P. sculpturata. The photomontage of a supposed cotype minor of welgelegenensis shown (or at least formerly available) on The Smithsonian Institute website at http://ripley.si.edu/ent/nmnhtypedb/public/specimeninfopage.cfm?publicconsumption=1&typespecimenID=892 appears to be a normal eastern Africa sculpturata. The Antweb type images of dignata (below) show that both major and minor workers are some 25% smaller than the welegelegenensis major and minor workers. The major clearly has a different shaped head in full-face view and the minor has much less sculpturation. IThe photomontage is of a major from Benin, (RVA3019). IThe photomontage is of a major from Benin, (RVA2940). IThe photomontage is of a minor from Benin, (RVA2940). IThe photomontage is of a minor from Cameroun, 30 km east of Poli (McKey Wolbachia project, Cameroon 128). Size matches the type minor. The photomontage is of a minor from Cameroun, Awae II; collector A Fotso Kuate (fk pheidole sp a). Size matches the dignata minor. The photomontage is of a minor from Cameroun; Awae II; collector A Fotso Kuate (fk pheidole sp e). Size matches the type minor. The photomontage is of one of three specimens from Gambia, Abuko Nature Reserve, 13°23'41" N 016°38'41" W, collected by Roy W Goff, 02.xii.2009. 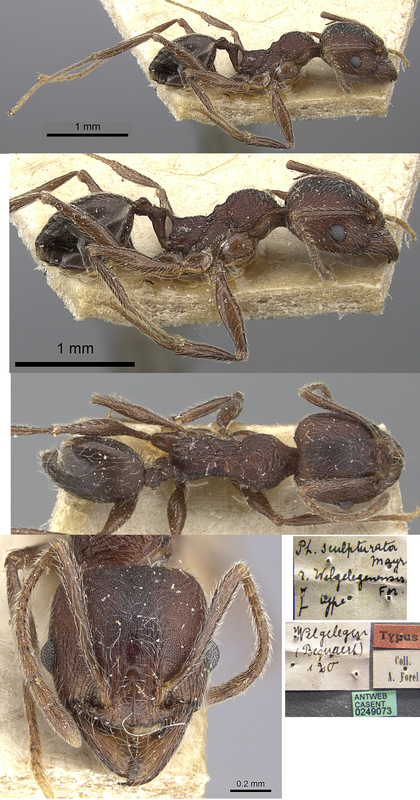 This minor worker is clearly different from the Congo Basin specimens shown above in lacking the coarse rugulae on the front of the head, combined with less intense spiculation on the head. The gaster has a pattern in incurved decumbent hairs, whereas the others show a random scattering of the gastral hairs.